Integrity and credibility are the keys to 15 years of success for Tom Kasner Crane Sales Inc in providing used cranes to the lifting industry. Whether you’re looking to purchase or sell a crane, rely on Tom’s 34 years of equipment experience and knowledge to help you. With a large pre-inspected inventory available and years of contacts, Tom can assist in locating the right crane for your application. 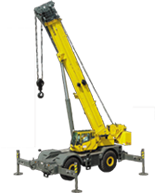 Tom Kasner Crane Sales, Inc. buys, sells and brokers used cranes. Take a moment to browse available inventory by clicking on the categories below. Can’t find what you’re looking for? Give Tom a call at (330) 670-0430 or click here to complete the short inquiry form and Tom will help locate the used crane to meet your needs.